San Antonio–New Braunfels is an eight-county metropolitan area in the U.S. state of Texas defined by the Office of Management and Budget (OMB). Colloquially referred to as Greater San Antonio, the metropolitan area straddles South Texas and Central Texas and is on the southwestern corner of the Texas Triangle. The official 2011 U.S. Census estimate showed the metropolitan area's population at 2,194,927—up from a reported 1,711,103 in 2000—making it the 25th largest metropolitan area in the United States. Austin–Round Rock lies about 80 miles northeast of Greater San Antonio. San Antonio–New Braunfels is the third-largest metro area in Texas, after Dallas–Fort Worth–Arlington and Houston–The Woodlands–Sugar Land. It is also the second fastest-growing large metropolitan area in the state (over 1 million population), after Austin–Round Rock and just ahead of Houston–The Woodlands–Sugar Land. 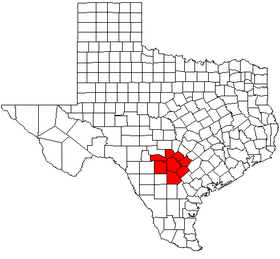 There are eight counties that combine to form Greater San Antonio. The central county is Bexar. The MSA covers a total of 7,387 sq. mi. 7,340 sq. mi. is land and 47 sq. mi. is water. Greater San Antonio has a number of communities spread out across several counties and regions. It is centered around the City of San Antonio, the second largest city in Texas and the seventh largest city in the USA, with roughly 1.4 million residents spread across approximately 500 square miles. Other regions include the Randolph Metrocom and the surrounding counties. 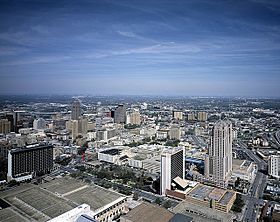 Downtown San Antonio is the urban core of the metropolitan area. New Braunfels is the second largest city in the metropolitan area and is a satellite of San Antonio. 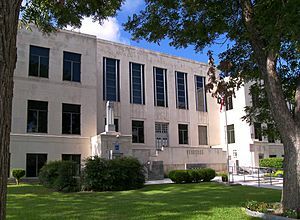 Seguin is the fourth largest city in the metropolitan area and is a satellite of San Antonio. 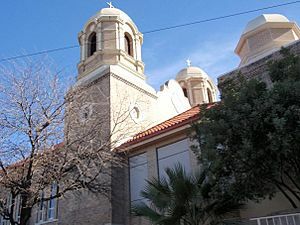 Alamo Heights is an inner-ring suburb of San Antonio. Together with Olmos Park and Terrell Hills, Alamo Heights is a relatively short distance from Fort Sam Houston and Uptown, Midtown, and Downtown San Antonio. Downtown San Antonio from U.S. 281 southbound. The San Antonio International Airport (SAT) is located in Uptown San Antonio, approximately eight miles north of Downtown. It has two terminals and is served by 21 airlines serving 44 destinations including six in Mexico. VIA Metropolitan Transit is the metropolitan area's public transportation authority, serving the entire City of San Antonio and many of its suburbs throughout Bexar County. San Antonio Station serves as the area's Amtrak train station. As of the census of 2000, there were 1,711,703 people, 601,265 households, and 432,131 families residing within the MSA. The racial makeup of the MSA was 71.4% White, 6.2% African American, 0.8% Native American, 1.4% Asian, 0.1% Pacific Islander, 16.6% from other races, and 3.4% from two or more races. Hispanic or Latino of any race were 50.4% of the population. The median income for a household in the MSA was $40,764 and the median income for a family was $46,686. Males had a median income of $32,143 versus $24,007 for females. The per capita income for the MSA was $18,713. Greater San Antonio Facts for Kids. Kiddle Encyclopedia.